Broadline Spot-On Solution for Large Cats is for the treatment and prevention of flea and tick infestations, biting lice, roundworms, hookworms and tapeworms in cats and kittens weighing 2.5 - 7.5kg. Broadline is a topical solution containing fipronil, (S)-methoprene, eprinomectin and praziquantel and controls flea bite hypersensitivity by flea control and will kill newly acquired fleas within 8-24 hours. Topical application to the base of the neck once a month. We used to use Frontline for our cat but found it wasn't working at all, our vet recommended Broadline and although more expensive really does work in controlling fleas. 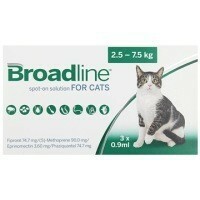 Since using Broadline we have not seen one flea or any first either. The applicator is easier to use too. Bought from vetuk with a prescription and received by return of post.